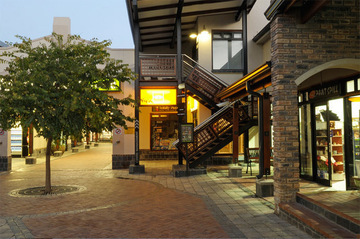 Sunridge Village Shopping Centre is situated on the western side of Port Elizabeth in the peaceful and leafy suburb of Sunridge Park. 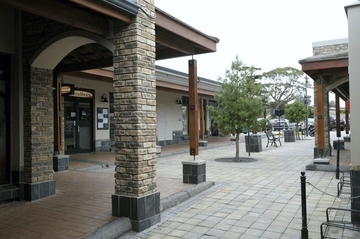 Erf 1 Sunridge Park which now houses the Sunridge Village, has always been a sociable spot. In the 1800's the original farmstead was a gathering place for local farmers and travellers, en-route to Port Elizabeth, resulting in informal trading of produce and wares, while providing a place of rest. It was a farm where people gathered to find out the news of the day and to outspan their ox wagons before the final trek into Port Elizabeth. This area was the furthest eastern boundary of Khoisan settlement and many place names in the area were derived from traditional Khoisan language albeit heavily altered over time. This explains why "streets" in the Centre have been given original Khoisan names. The first phase of Sunridge Village was completed in August 2004 and the second and final phase was opened in May 2008. All in all there are 51 shops covering approximately 9 000m2 offering a true "one stop shop" and thus a complete and more holistic shopping experience. 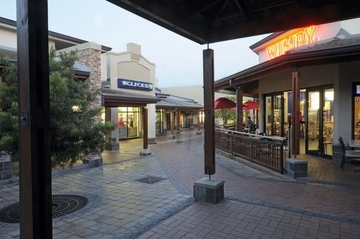 Sunridge Village features visually striking Cape Vernacular architecture, cobbled and paved pathways, wrap-around verandas, a Village Green and a Village Square style meeting area. The slate roof tiles from an original building were cleaned and re-cut to be used as wall cladding, while natural timber elements add warmth and character to the overall experience. 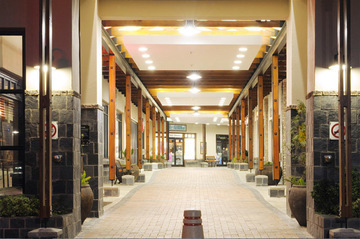 The outdoor experience enhances the retail experience at "the Village". More specifically, the use of street furniture enhances the al-fresco experience which is punctuated by benches, tree grids, arrow boards, street name signs and slate-clad refuse bins, all contributing to the perception of "Village street". The safety of shoppers features prominently, and with this in mind there is a surveillance system with more than 40 CCTV cameras. This feature, together with competent and customer-friendly security personnel, means that the entire shopping centre is covered 24 hours a day. So-called car guards are not permitted. The security of shoppers using ATM's has also been taken into consideration, with 4 of the 5 ATM's being adjacent to the security control room which is fortified with bullet-resistant glass. Other features include a unisex baby changing facility and paraplegic access to all shops. A wheelchair is available from security for the use of shoppers. The award-winning indigenous gardens which surround the Centre were established after all alien vegetation, including thirsty Eucalyptus trees, were removed. Indigenous trees such as Henkel's Yellowwood, White Stinkwood, Acacia Karoo, Fever Trees, Cabbage Trees, Tree Aloes, Kei-Apple, Cape Ash and Karree have replaced the alien invaders. In order to assist the public, name tags appear on trees in four different languages. Lower shrubbery consists of grasses, reeds and flowering plants. All the rock used in the landscaping was exhumed from the site during construction. The Centre boasts a number of awards from organizations such as the SA Council of Shopping Centres (SACSC), the SA Property Owners Association (SAPOA) and the South African Landscaping Institute (SALI) as well as a number of Service Excellence Awards. Close to 500 jobs have been created and community involvement and benefit are pivotal to Sunridge Village - from using local suppliers for the development, building and leasing aspects, to an annual family fun run, regular specials and a weekly Pensioners' Day. In every way possible we have tried to create a shopping centre that works with, as well as for, the residents of the surrounding areas.